Home › FAQ › When Should You Take a Campus Visit? When Should You Take a Campus Visit? If you’re the parent of a high school student, you may be wondering when you should take a campus visit. Preparing for college can be a hectic and confusing time. There are a number of important tasks and milestones to keep in mind. One of the most important is the campus visit so that your son or daughter can actually get a feel for various schools and campuses, as well as aspects of each institution’s academic and campus life. It’s wise for parents to attend these visits also in order to provide input or advice on things your child may overlook. On-campus trips are an ideal time to ask questions about such things as meal plans, health services, campus safety, financial aid and more, according to the College Board. Campus tours don’t have to be overwhelming. Here are some things to keep in mind when plannign campus visits. There are some times that are better to go on campus tours than others. You want to visit when most of the students are in attendance so that you can get a true feel for the vibe of the school. Two prime times to consider are the spring of your child’s junior year of high school or fall of senior year. You’ll be able to see the schools at peak times of action, and you’ll have plenty of chance to reflect on what you learn prior to your child making a final decision. Though they may not give you as accurate a picture as during the academic year, summer will work for visitations, as some students are still around. Avoid midterm or final exam times, as well as holiday breaks. A call ahead will let you know when scheduled tours and other activities may be taking place, and you can be sure to learn the visitation policies. Plan ahead if you’re considering when you should take a campus visit. Make a plan for the order in which to go. You may wish to schedule day trips close to home first or to shoot for the school of most interest before all others. Do try to be practical when scheduling trips far from home and take time to schedule visits to more than one institution in close geographic proximity. Even if you’re not able to make a school’s formal visitation day, it’s recommended to call ahead to schedule appointments with key representatives such as admissions professionals, coaches or housing staff. There’s no point in taking a trip only to find out the people you want to see aren’t available. Walk-in appointments are not something most college staff can accommodate. Try to set up your appointments and visits at least two weeks ahead of time. Visiting a college campus is one of the best ways to determine if a school is a good fit for your child. Campus culture, helpfulness of faculty and staff or accommodations are hard to get a feel for from a catalog or website. 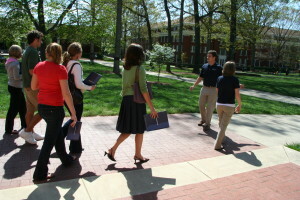 These tips should help you in deciding when you should take a campus visit.